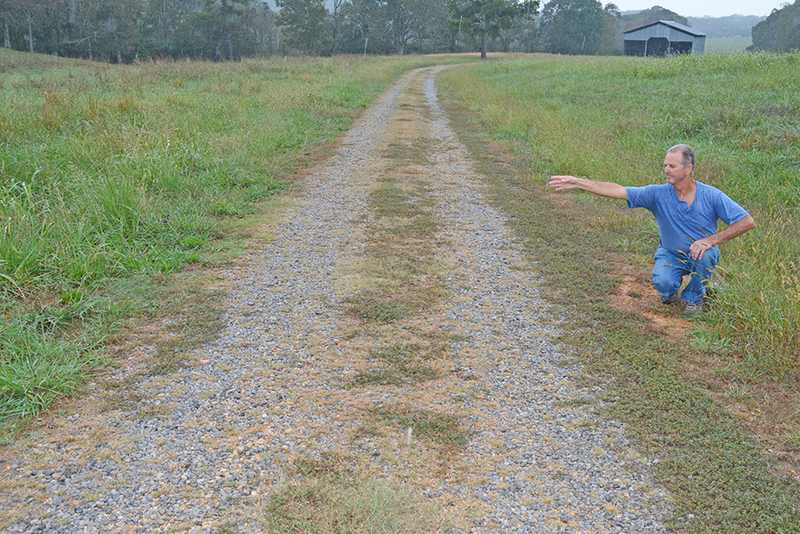 Addison resident Larry Robinson shows where the gate was once located, that had to be removed across the old roadbed he claims has not been a county road in at least 50 years. ADDISON - The issue of whether a road currently known as Bridgeview Drive in the Addison area is a county road or not now rests in the Winston County Circuit Court for a judge to decide possibly in 2019. Resident Larry Robinson has been expressing a grievance against the Winston County Commission, claiming that Bridgeview Drive that travels by his home has not been a county road for years. However, Robinson claims he was informed that a gate he placed on that road had to be removed and was removed because the road was deemed a county road. “This road has not been a county road in the last 50 years,” Robinson pointed out. Robinson, with others living in the area in agreement, named the road Bridge View Drive on May 29, at which time it was deemed a county road, he said. However, Robinson argues the road has not been a county road since Enhanced 9-1-1 changed addresses for Winston County residents back in the 1990s. At that time, Denson Road was renamed County Road 148. “They didn’t name mine,” Robinson said, questioning officials about how the name was changed to Denson from 148 since no Densons lived in the area. “They just gave us Denson Road,” said Robinson. The road in question is actually the old roadbed for the old Highway 278. The road had been termed 278 as long as it went all the way across the area which eventually became known as Smith Lake. However, when the lake was formed in the early 1960s, the road was no longer called 278, since portions of the road were covered by the lake when it was backed up. Also, a new Highway 278 was constructed through the county around that time. “The point I am making is that in 2000 when I bought this place (my house), I was going to put cattle on my land,” said Robinson. In these plans, Robinson placed a drive-across gate across the old roadbed. However, county officials, Robinson claimed, made him remove the gate, noting he could not place a gate across a county road. Robinson also claims that in 2012, when the county road map was released, it did not show what is now called Bridge View Drive as a road. “This road didn’t even exist,” Robinson claimed, based on the map. Robinson argues based on these things that the road is on private property, is not a county maintained road, and he has a right to place a gate on his property. County Attorney Hobby Manasco explained the issue of whether the road in question is a public or private road rests with the court. The Winston County Circuit Court will decide whether or not the road in question is a public or private road, Manasco said.